When many people think about serious bicycle accidents, they think of a person riding a bike on a roadway who is hit by a motor vehicle. While this circumstance is not rare and can result in the cyclist sustaining serious bodily injuries, this is not the only way in which a bicycle collision can bring about damages to biker’s body and/or bicycle. Even though it’s late March and the weather is still not allowing us to get out in Indiana and ride our bikes, the time will soon come where all the major bikeways in the Indianapolis area will be crowded with runners, bikers, and the like. The Indiana Bicycle Lawyers, as proud members of the Indiana cycling community, realize that this is an ideal time of year to get out and enjoy all the resources that the State of Indiana has provided for us; however, we also want to take the time to caution you of the dangers associated with increased outdoor activity and also educate you on how the law in Indiana applies. With increased Hoosiers using the outdoors for biking and working out, accidents that occur on bikeways, like the Monon Trail in Indianapolis and Carmel, tend to spike. This is not hard to believe. If you have used bike paths like the Monon Trail before, you know that the pathway itself can be very narrow in places, making it hard to navigate when the trail is congested with foot, bicycle, skateboard, and other types of traffic. It is not unusual for bikers to collide with one another or for a cyclist to collide with a person merely looking to experience a relaxing walk on a nice day. To add to the danger, in many places along the Monon Trail, there is a steep drop off from where the trail’s concrete pathway meets the earth, which can add to injury. As a result, the Indiana bike attorneys at Caress Law Group encourage you to follow the rules of the Monon Trail: stay to the right unless passing, only pass when it is safe, and voice your intention to pass a person so that they know you are approaching on their left side. Unfortunately, accidents caused by bicycle vs. bicycle or bicycle vs. runner/walker/roller-blader, etc. can cause injuries just as severe as those caused by automobiles. If you are injured while on the Monon Trail or any other bike pathway due to the fault of another, make sure you obtain that person’s valid information (name, address, insurance info) and even ask to see his or her Indiana driver’s license if possible. If you have a cell phone with you, make sure you call them to file a report of the incident. Under most circumstances, these individuals are covered by home owner’s insurance, and you can make a claim against their home owner’s insurance to make sure you are properly compensated for your injuries. The Indiana Bicycle Accident Lawyers of Caress Law Group are committed to ensuring that Hoosier bicyclists, runners, and other pedestrians remain safe. 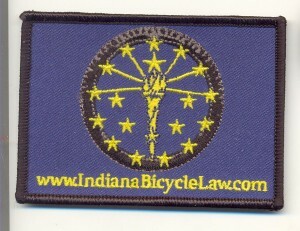 Please visit our blog, www.IndianaBicycleLaw.com, for Indiana Bicycle Laws and click here for a free Indiana flag sticker and/or patch. If you have a question about Indiana personal injury or medical malpractice law, please contact Indianapolis Bicycle Lawyer Lance Worland by calling him at 317-255-5400 or emailing him at Lance@CaressLaw.com. Initial consultations are always free. The Indianapolis Bicycle Accident Lawyers at Caress Law Group are privileged to share with you that recent news reports are indicating that the South Bend Common Council voted 9-0 in favor of an ordinance requiring motor vehicle drivers to provide at least 3 feet of distance when passing bicycle users on the city’s roadways. As a matter of fact, no person present at the meeting spoke in opposition to the law. The Bicycle Accident Attorneys in Indiana salute Gavin Ferlic for introducing this idea to the City of South Bend. You may be wondering how such a law can be enforced, as it is highly unlikely any law enforcement officer will have the opportunity to measure the distance between passing vehicles and the bicyclist. The recent news developments indicate that each individual police officer will have discretion in determining whether or not a driver is too closely passing a cyclist. Officers will not issue tickets to vehicles not leaving enough space unless it is clear that most citizens of South Bend know the new law. Realistically, attempting to enforce this new law will provide a police officer an ideal opportunity to stop the passing vehicle and educate them on the law so that they leave more space next time they pass a bicycle user. 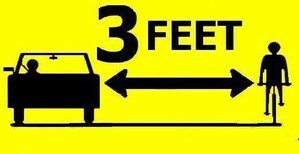 South Bend is just the third Indiana city to pass the 3 foot rule, joining Fort Wayne and Indianapolis. No similar state law exists. One of the obvious reasons for enacting this new law is to prevent motor vehicle vs. bicycle collisions and, as a result, prevent severe injuries. However, another very important motivation behind this law is to educate drivers and bike riders about the importance of sharing the road. It is vital to our Indiana community that bicyclists and motorists alike respect all others using the roadways. The Indiana bicycle lawyers at Caress Law group support the City’s efforts to reduce South Bend bicycle accidents and increase harmony on the roads. If you have any questions about bicycle law in Indiana, please contact Indiana Bicycle Lawyer Lance Worland by calling 317-255-5400 or emailing him at lance@caresslaw.com at any time. All initial consultations are free. Also, please be sure to request an Indiana Flag patch or sticker free of charge to support the Indiana bicycle community. Caress Law Group’s Indiana Bicycle Accident Lawyers are excited to spread the news about the spIN 2013 Indiana Bike Summit set to take place at the Alexander Hotel in downtown Indianapolis’ new City Way development. This multiple-day event is hosted by Bicycle Indiana and consists of some very insightful presentations on topics relevant to Hoosier cyclists, a dinner, an opportunity to promote your club or organization, and is then capped off by a bicycle ride downtown. Those interested should register as soon as possible, as the event takes place this week: March 14 – 16. The Indiana Bike Summit begins at 5:30 p.m. on March 14th with a dinner consisting of local hosts. The event starts up again on March 15th at 8 a.m. with presentations on the health benefits of cycling, the economic impact of cycling, and biking infrastructure. On March 16th, the summit will pick back up at 8 a.m. with forums, advocacy discussions, and an opportunity for participants to promote their individual club, event, and/or organization. At 1 p.m., Indiana Bicycle Summit participants are invited to go for a bike ride that will utilize Indiana’s vast bike lanes, trails, and paths. The Bicycle Lawyers at Indiana Bicycle Law would encourage all Hoosier cyclists who have the time to attend this unique event. It is a rare opportunity to listen to knowledgeable speakers, such as David Pauer of the Cleveland Clinic and members of the Toole Design Group, present information that directly relates to something that is continually growing in importance to our community in Indianapolis and throughout Indiana. If you are not already familiar with the goal and mission of Bicycle Indiana, the Indiana Bicycle Accident Lawyers encourage you to frequently check their website for upcoming events and opportunities such as the 2013 Indiana Bike Summit. Bicycle Indiana serves all cycling Hoosiers by providing information, promotion, education, organization, and advocacy. They are located in downtown Indianapolis at the Indy Bike Hub YMCA. If you are interested in registering for this event, click here. 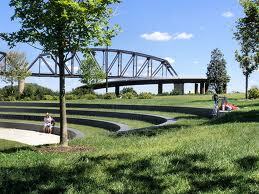 The Indiana Bicycle Accident Lawyers are excited to pass on the news of a pedestrian/bicycle bridge preparing to open in Jeffersonville, Indiana. The Big Four Bridge is a railroad truss bridge that was completed in 1895 and currently crosses the Ohio River, connecting Jeffersonville with Louisville, Kentucky. Although the Big Four Bridge was abandoned for many years, it will soon be booming with pedestrian and bike-friendly traffic. The bridge is almost complete, and it is scheduled to consist of bicycle and pedestrian paths extending all the way across the bridge with newly built ramps at the each end of the bridge, connecting cyclists and pedestrians with the cities of Jeffersonville and Louisville. Although the Louisville-side ramp has already opened, the City of Jeffersonville is hopeful that its ramp will open in the upcoming months. However, the most recent news to come out of this story is that the City of Jeffersonville plans to construct additional walking and bicycle lanes to the City’s downtown area before the Jeffersonville ramp to the Big Four Bridge opens. Recent reports indicate that adding these additional bicycle and pedestrian lanes to the City’s streets and downtown area will boost business and quality of life in Jeffersonville. As mentioned in some of our previous posts, the landscape of southern Indiana is breathtaking. The Indiana bicycle lawyers plan to take our bikes down to Jeffersonville upon completion of these new trails, and, once we do, we will provide readers with a review of these new paths. 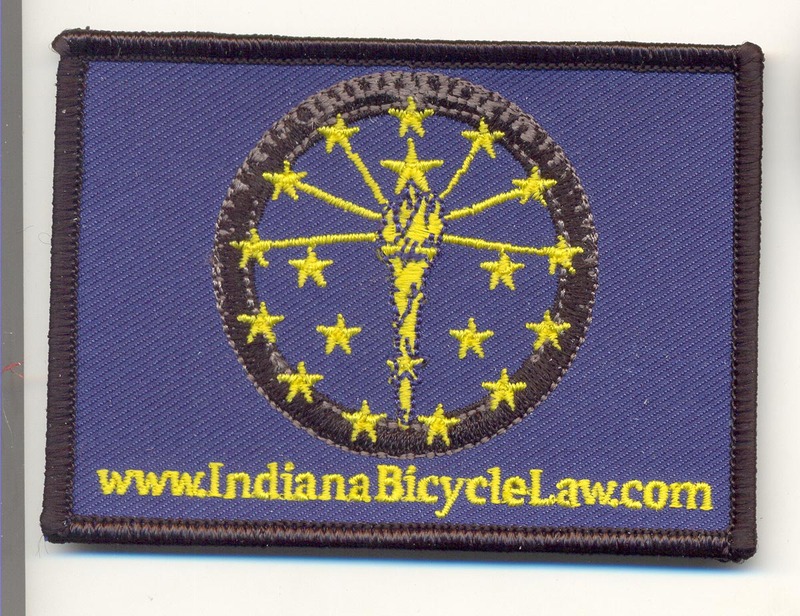 Please feel free to request a Bicycle State of Indiana Flag or Patch from us for your next ride, and we will send it to you free of charge. Our goal is for Hoosier cyclists to remain united and proud of the strides our state has taken in making our cities more bicycle friendly. Feel free to contact us or call us at 317-255-5400 with any questions. Caress Law Group’s Indiana bicycle accident lawyers are very excited to help spread the word about the upcoming “Bike to Barns” event. This event is hosted by the Local Growers’ Guild and is set to take place on March 30, 2013. Cyclists of all ages and skill levels are invited to tour southern Indiana’s breathtaking landscape and visit a number of different farms along the way. These rides will take place throughout Monroe, Brown, and Owen counties. The Local Growers’ Guild will donate all funds to their cause – which consists of farmers, retailers, and members of the community focusing on improving the food economy in southern Indiana through education, support, and market connections. The ride begins at 9 am at Binford and Rogers School in Bloomington, Indiana. From there, cyclists will be released in waves and can then choose from three different routes: a 6 mile “Urban Fruit Route,” a 35 mile “Seed Route,” and a 70 mile “Root Route” for the more weathered cyclists. Bikers will periodically be guided to local farms to interact with the local producers and growers. The Indiana bicycle lawyers salute the Local Growers’ Guild for organizing this event that will benefit the southern Indiana farm community while also promoting bicycle use. For Hoosiers looking to spend some quality time with their children and family, Bike to Barnes is perfect for you. If you haven’t been able to ride your bike or run through the hills of southern Indiana, you should really give it a go and participate in Bike to Barnes. The southern Indiana hills will provide magnificent views, especially toward the end of March. Bike to Barns will even provide riders with a free Bike to Barns t-shirt and discounts at some of Indiana University’s favorite hot spots, like Nick’s English Hut and Upland Brewing Company in Bloomington. The Indiana Bicycle Lawyers will continue to provide you with the latest Indiana bicycle news, laws, and resources, and we believe that Bike to Barns is an event all available Hoosier cyclists should consider. If you have any questions regarding this post or any issue involving Indiana bicycle accident law or personal injury law, please contact Indiana Bicycle Lawyer Tim Caress by calling him at 317-255-5400 or emailing him at Tim@CaressLaw.com. Indiana news sources report that 48 year-old Mark Crosby of North Vernon, Indiana has died as a result of injuries sustained in a bicycle vs. motor vehicle accident near Seymour, Jackson County, Indiana. 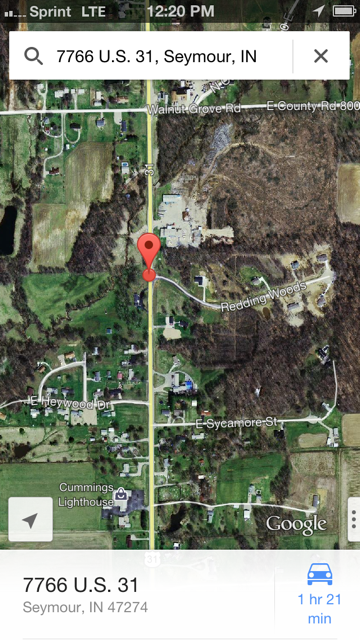 The bicycle accident is reported to have occurred on U.S. 31 near Redding Woods. According to sources, Mark Crosby was riding his bike northbound along U.S. 31 when a 2006 Dodge Status driven by 53 year-old Gary Hollin struck the bicycle, causing Crosby to be ejected from his bike. Sadly, Crosby was pronounced dead at the scene of the accident. According to the Indiana State Police, blood testing is required by law for any driver that is associated with a fatal automobile collision. According to the most recent reports, the results of this blood test are still pending and the bicycle crash remains under investigation. Our thoughts and prayers go out to Mr. Crosby’s friends and family, particularly his wife and four young children. Unfortunate events like these are heart-breaking but can serve as a reminder to Indiana bicyclists just how exposed we are when we are riding near traffic. Even though there are currently no additional details about this bicycle accident, we encourage all cyclists to wear a helmet and be attentive at all times while biking, especially near traffic. We also strongly encourage pedestrians walking near traffic to remain aware of the environment around them so that they might be able to avoid a collision based on a driver’s negligence. If you have any questions concerning this post, please do not hesitate to contact Caress Law Group’s Indiana bicycle accident lawyers Tim Caress or Lance Worland at any time at 317-255-5400. As cyclists themselves, they take great pride in providing Indiana bike users with biking news and insight.